Wiping the sweat off my brow and panting in exhaustion, I took my backpack off – a brief respite from hauling a week’s worth of food and essentials – and sat down on a large boulder to survey the landscape. Beneath me, Mitchell and Simon struggled up the hill, out of the tundra and into the lunar-esque landscape. To my right, in the distance, I could see the world’s second largest permanent ice cap; in front of me sat a bowl-shaped valley, populated by dozens of lakes – some paddling pool-sized, some reservoir-sized – and fortified by ancient rock faces that sharply rose from the heathland. And to my left, out of sight for the time-being and beyond more undulations and lakes, was a little red wooden hut, that night’s resting place. Above, the sun radiated its glow onto the autumnal colours of the tundra and struck a golden shine across the sky. The remoteness, the wilderness and the beauty held me spellbound. 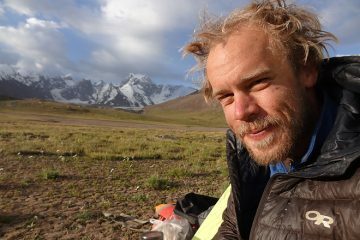 The isolation didn’t need reinforcing – indeed, few animals even reside in these parts – but Simon delivered it, the inner-climber in him invigorated. “That’d be a nice gully to climb up in the winter,” he proclaimed, pointing away to his right. “How many pitches, do you reckon?” I asked. “Three, four. Don’t know.” No one probably knows. 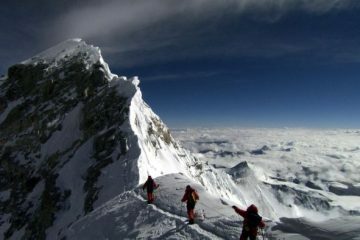 No person has probably ever even stood at the top of the mountain in question, that’s how remote this part of the world is. The mountains are nameless. The lakes, too. Likewise the valleys and gorges. 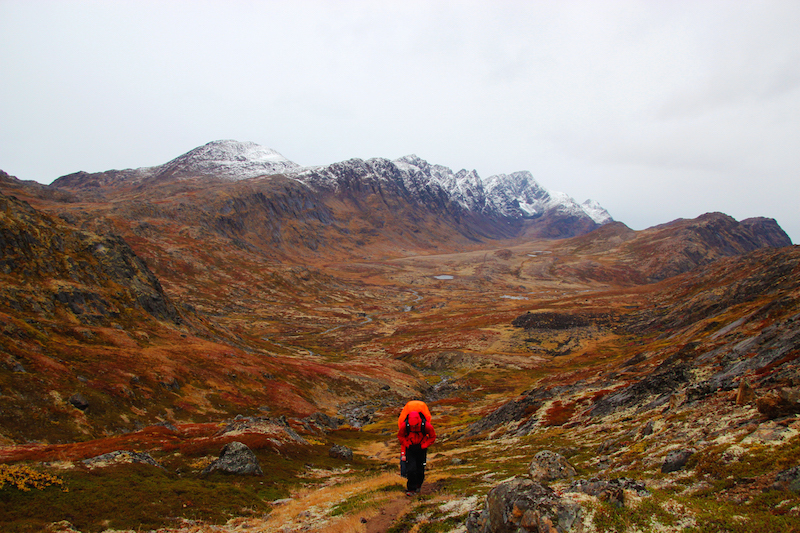 It was day five on the Arctic Circle Trail in west Greenland, a 102-mile self-sufficient hike, and just like the preceding four days, all around us was virgin, untamed land. And it was enchanting. Think of Greenland and the chances are you will be consumed by thoughts of ice and polar bears. It’s not so far wrong: approximately 80% of the country is an ice-sheet, some of it three kilometres deep, and in winter temperatures on the north of the country average -20C. But the world’s largest non-continental island is not engulfed by blizzards and a sub-zero mercury all year. Greenlanders – of which there are just over 55,000 of them – have a saying that June is spring, July is summer, August is autumn, and the rest of the months are winter. 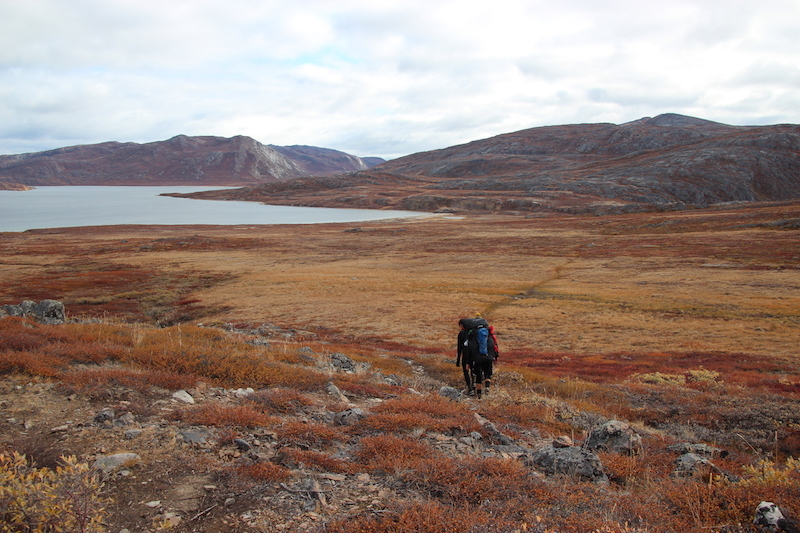 And so, when the weather warms up, almost 20 percent of the ice melts and retreats, uncovering a treeless but exceptional landscape that also includes the Arctic Circle Trail’s path. Usually hiked by just a few hundred people annually (we saw just 27 people throughout the week) the walk links the two settlements of Sisimiut and Kangerlussuaq, sticking mainly to the valley floors and thus accounting for just 3,300m of elevation – the equivalent of three ascents of Snowdon. In winter, it is traversed by dog sleds and snowmobiles, but in the three short summer months – often under the midnight sun – it is trekked by hikers from across the world. The proverbial middle of nowhere has never been more appropriate than out there, in the Greenland wilderness, where social media is obsolete and you can count on one hand the number of fellow humans you see each day. It is this that attracts most people to the trail. But for three 21-year-olds, who are as accustomed to the sticky floors of nightclubs as we are multi-day hikes in the rural Scottish Highlands, the idea of getting away from it all wasn’t the reason why we opted to this far-flung outpost of the world. 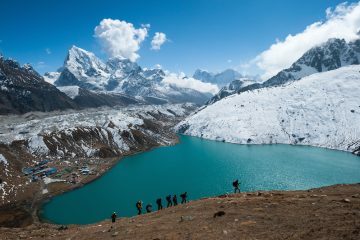 It was the reputation of it being one of the greatest hikes in the world, coupled with the fact that it wasn’t a mainstream trek, that appealed to us. The adage goes that “when you’ve seen the world, there’s always Greenland”. To be able to boast that we had been to the land of polar bears, icebergs and the northern lights was our real motivation. An admission, though: the first few days were less than great. 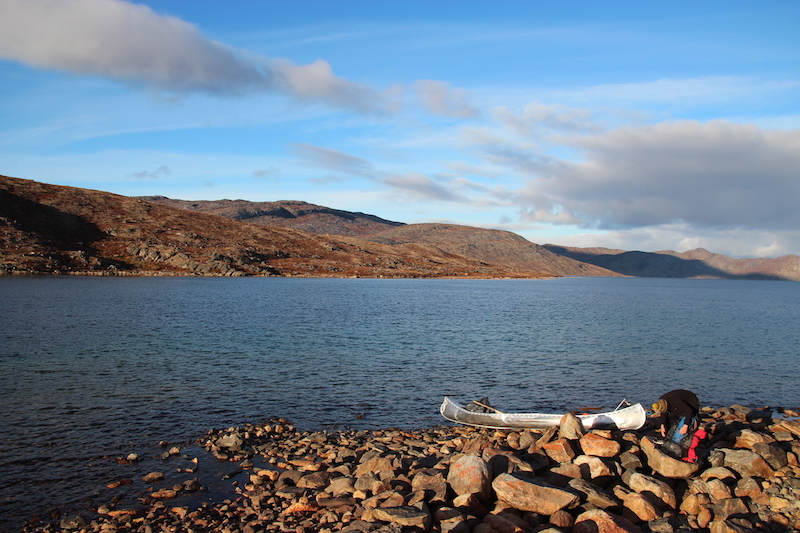 Starting from Sisimiut, we headed east, on our venture to Kangerlussuaq. But the grey sky unleashed an unremitting drizzle and sleet that left us wondering if we should have packed our crampons as opposed to flip-flops. Meanwhile, the terrain underfoot – sodden by the rain – was boggy and marshy in places. A fast-flowing stream demanded that we crossed it three times in less than 500m and the waterproof lining of my trail shoes was breached, water sloshing between damp socks. Why didn’t I pack crocs, I cursed. Tired, fatigued and wet, if I had access to phone signal, the pre-watershed version of an expletive-laden message would have read: “Why did we do this?”, signed off with a series of curious-looking and angry emojis. This was most certainly type three fun. On an internal flight to Ilulissat, I had the privilege of sitting in the cockpit. The pilot, having learned why we were in Greenland, questioned: “Why walk, when you can fly?” Right then, I agreed with him. But with no signal, no shops and hardly anyone else around, giving up wasn’t an option. We were carrying 20kg worth of clothes, sleeping gear, essentials and food that would last a week. We had to persevere. Upon reaching the end of the second day’s walk, however, the rain clouds parted and Greenland decided it was time to repay us for taking this rarely-trodden pilgrimage. We had read about the Arctic Char that replete the lakes and streams, and how easy it supposedly was to catch them. The books in the huts that double up as the diaries of countless trekkers read like a roll of honour, people proudly writing that they had caught and eaten their own fresh fish. So, armed with a lightweight fishing rod, we headed down to the lake where we were greeted with dozens of pink salmon-like fish, some weighing (a non-fisherman’s estimate, let it be said) three or four pounds. Best of all, they were so close to the surface that we were able to put our hands in the water to grab them, rendering the fishing rod useless. Food that night was superb and I gave the Arctic Circle Trail my first thumbs up. The kudos from thereon in kept on coming. The sun appeared which left us snapping away on our phones and cameras, looking for that perfect Instagram photo that we would post as soon as returned to the land of WiFi and virtual interactivity. Deciding what constituted as the image du voyage was becoming ever more difficult. 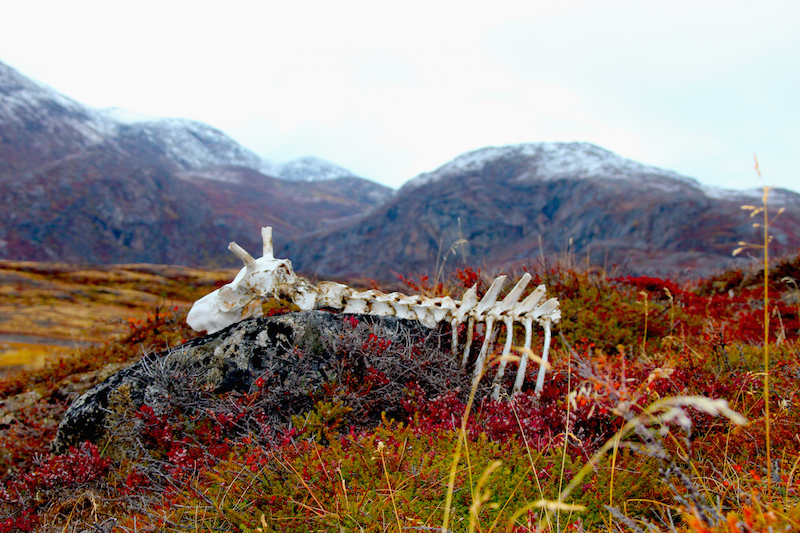 Would it be the views across to the ice cap with the mountains in the foreground, or the discarded bones of reindeer skulls, antlers and skeletons? Perhaps it would be the Aurora Borealis. Walking the trail in September, the beginning of the season for the dancing lights that dart their way across the northern sky, there was a slim chance that we would train our eyes on their acrobatic moves. We waited in hope. In the meantime, we enjoyed the menial tasks of just walking, assessing whether the berries beside us were edible, rationing our food supplies of couscous and oats, and collecting water from the streams. The sound of birds was more than an ample substitute to music, and reading a book at night after a day’s hiking was the perfect prelude to sleep. With the weather better, beaches that looked like they belonged in the Caribbean and the scenery transfixing us, we were at one with nature and Greenland. We walked the trail in early September and reading the books in the huts, it became progressively apparent that this was the best time to undertake the hike. July and August had yielded summer weather that would be more common in latitudes not in the Arctic Circle. 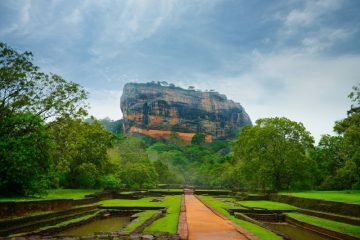 Tales were of warm, sun-baked days throughout the summer; of trekking in the morning and night under the nightless sky to avoid the heat and mosquitos that frequent the area in July and August. The warmth resulted in heathland fires, and there were rumours that the Ikkattoq hut had burned down, prompting some trekkers to turn around and abandon their walk. When we arrived at said hut, it was perfectly intact, but smoke still rose from the nearby burning embers of the charred scrubland. While we had been walking in comfortable temperatures between 6 and 10 °C, how incongruent, I thought, that just a few weeks before, hikers would have been walking in summer clothes, in summer weather, past burning heath fires, all the while casting their eyes out to the ice cap. 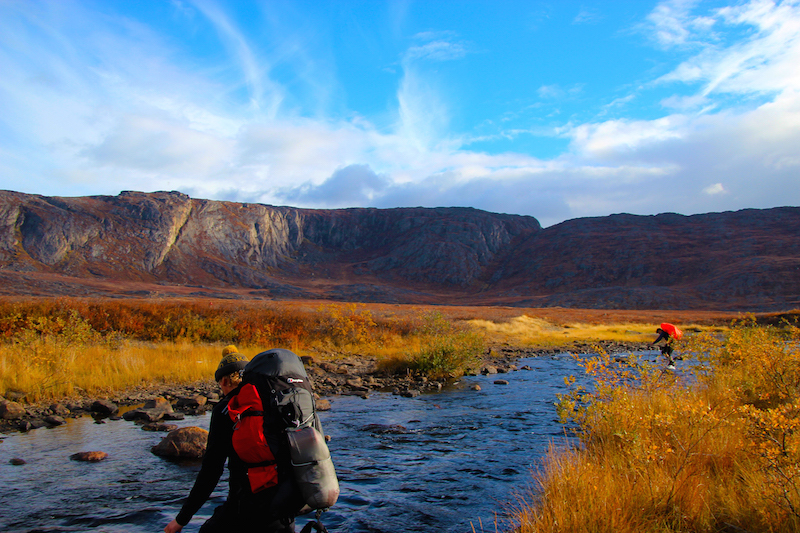 It was just another reason why Greenland and the Arctic Circle Trail mesmerised. Route-finding, for the most part, was simple. A distinct trampled path carved its way across the landscape; only sometimes did we veer off track and need to match a compass up to a map. 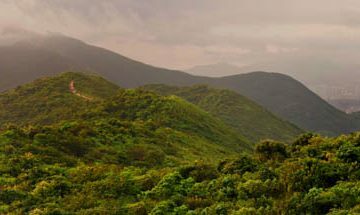 But just a few months before us, a solo trekker from Hong Kong had disappeared and, to this date, has never been found. In this vast uninhabited expanse of land – which is inhospitable in winter – it was a reminder of the potentially perilous nature of the trail. We were thankful for a satellite phone and one another’s company. We were also very grateful for the huts. Some were shaped like a garden shed with bunk bed frames and a worktop occupying much of the space, while two, against the larger lakes, were bigger buildings that were used by Greenlandic hunters in the winter and equipped with fire stoves. Many people camp on the trip, but with the chilly nights and vacant bed spaces, a roof that didn’t flap in the wind and one that we had much more faith in being waterproof, was far more appealing to us. We had worried about whether or not we had over-packed, or even if we hadn’t brought enough at all. 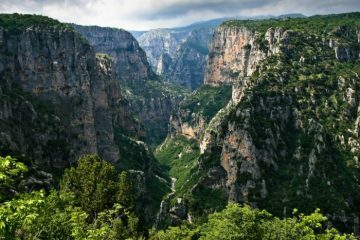 Having only ever done self-sufficient weekend trips before, it was a combination of youthfulness and fearfulness that embraced the challenge of walking for a week being utterly dependent on the contents of a backpack. It turned out, however, that the biggest worry on the Arctic Circle Trail was oversleeping. Once we had divorced ourselves from our sleeping bags and returned to the path, the quantity and variety of wildlife improved day-by-day. Arctic foxes scampered along beaches and the shores of fish-occupied lakes, while arctic hare and reindeer grazed on the steep slopes of the mountains. Polar bears live in the north and the east of the country and do not – thankfully – stumble into the path of unassuming hikers on the trails. By the end of the fifth day – the longest at 19 miles – we could see that night’s hut. Seemingly ready to transport us was a canoe, resting at one end of a lake. Giving us a chance to rest our blistered feet (walking boots are preferable to the trail shoes we all opted for), we hopped aboard. We were quickly back on land, however. A hole seeped water in and so we had to wait until the next day to travel by water, when we would use one of the six steadier, safer canoes to travel that day’s 13 miles. The wind was kind, there was no one else to steal our vehicles and so we divided into two canoes. After over an hour, though, the wind stirred and as a solo canoeist – not to mention novice – it meant that I was reversing quicker than I was moving forward. Simon and Mitchell persisted, making it to the hut before me, as I was left to walk the remainder of the day’s hike. If I was disappointed by my failure not to canoe the entire duration, I was rewarded later that night. Stepping outside the hut in the early hours, I looked up to be greeted by a profusion of green arrows pirouetting and striking elegant patterns across the cloudless, starry sky. We still had one more day’s walk before we returned to Kangerlussuaq, but for two hours, the three of us gazed upwards, engrossed by nature’s playtime. Greenland had delivered. June to September. Mosquitos are common from July to mid-August. Frosty nights are possible from the end of August. From October to the end of May, the route is usually covered in snow. Air Greenland flies daily from Copenhagen (from £231 one way) year-round while Air Iceland charter summer flights (from £146 one way) to Kangerlussuaq from Keflavik every Monday and Friday from July 17 to August 28. A number of airlines (Icelandair, Air Iceland, British Airways, easyJet) fly to Keflavik from the UK. 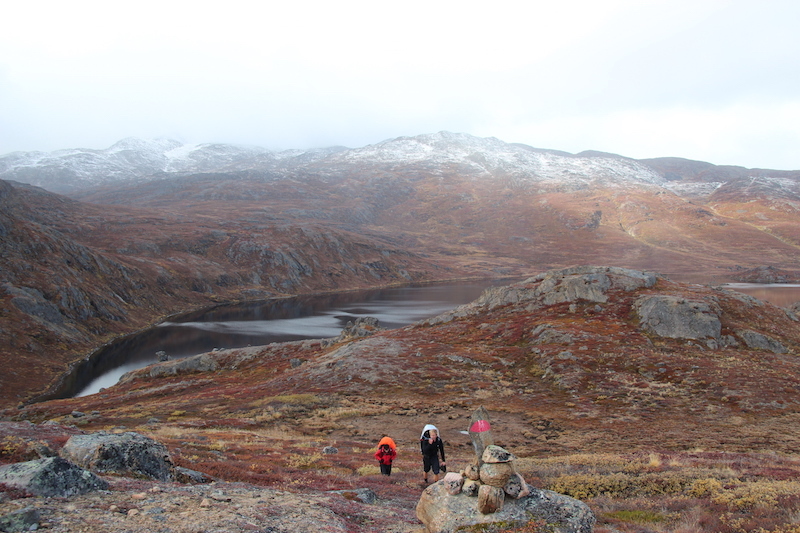 Most people walk from Kangerlussuaq and choose to finish in Sisimiut. 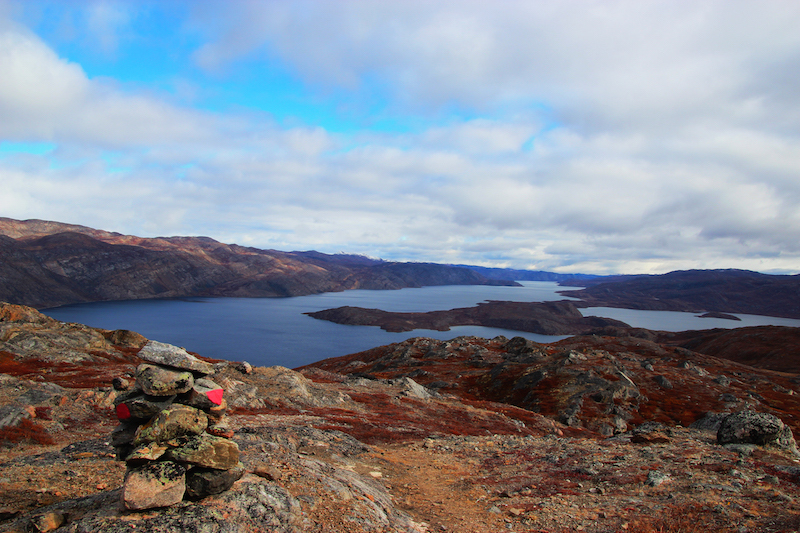 There are daily flights between Kangerlussuaq and Sisimiut from £115. Alternatively, it is not uncommon to walk there and back. Most people take between seven and 10 days each way. It is possible to start the hike or finish the hike at Russell Glacier, a spectacular sight where fresh meltwater cascades off the ice sheet. It is 16 miles from Kangerlussuaq. We opted to walk from Sisimiut so we could visit the Ilulissat Icefjord. Sunday ferries from Ilulissat to Sisimiut are priced from £145. You can only camp or stay in the huts during the hike. 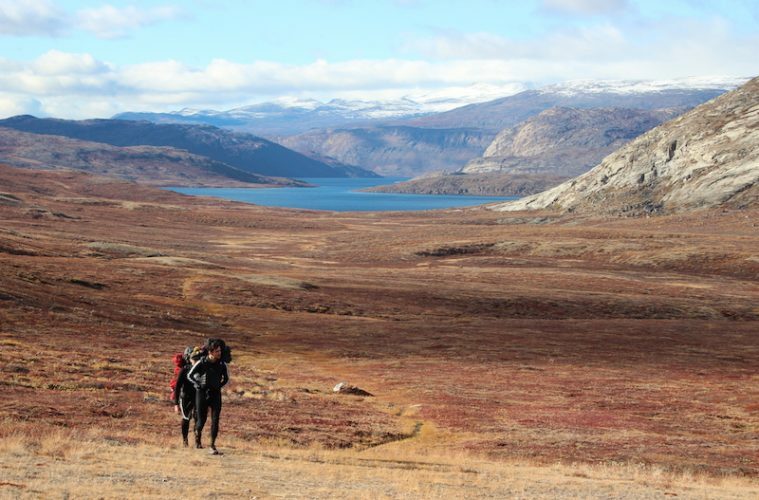 The Old Camp hostel in Kangerlussuaq is an ideal base before starting the hike or after finishing it. Prices from £43 include breakfast. Sisimuit Youth Hostel prices start from £23. A 65-litre backpack is highly recommended and you’ll also need to take food provisions. I took dry food (oats, rice, couscous, chocolate bars, dried fruits and nuts), but dehydrated packs are also popular. Clean water is all around. Due to cost (Greenland is one of the world’s most expensive places), it is best to buy food for your trip before you travel to Greenland. You will need a stove, pan and fuel (buy in Greenland) for cooking. A sleeping bag and a camp mat are essential while a tent or bivouac bag is recommended as space in a hut is not always guaranteed. Trail running shoes suffice, but in hindsight I would have trekked in walking shoes. Crocs are ideal for crossing streams. 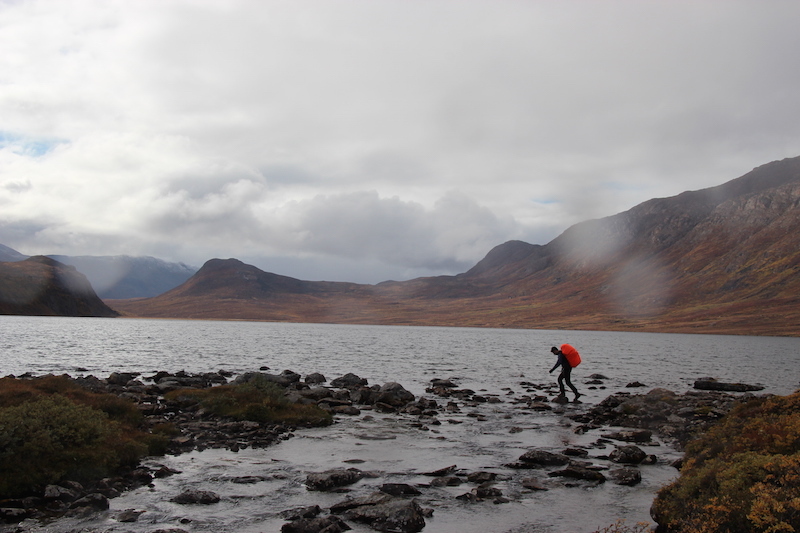 Standard hiking gear is recommended, with a waterproof jacket and trousers a must. As ever, sun cream and a mosquito net or mosquito spray are useful in summer months. Trekking in Greenland – Arctic Circle Trail by Paddy Dillon is an excellent, informative read accompanied with maps, route descriptions and photos (£14.95, available here). 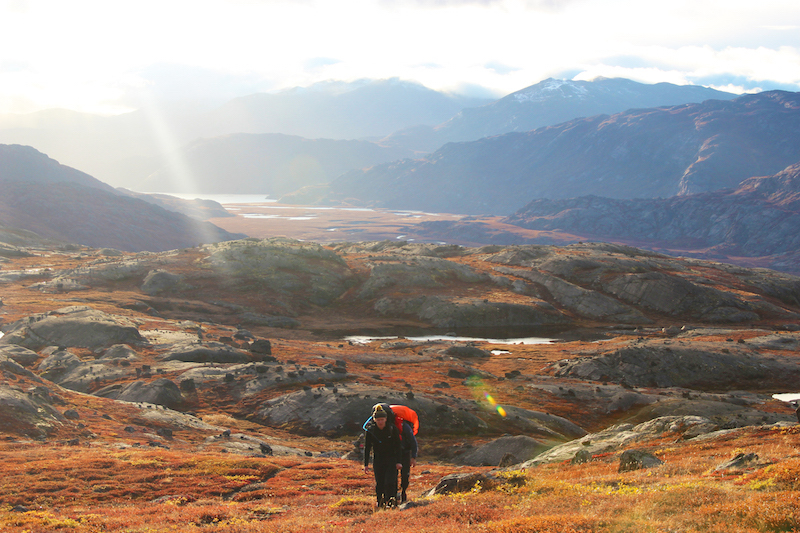 Aside from the Arctic Circle Trail, there is plenty to keep adventure seekers busy on Greenland. There are opportunities to view the Northern Lights, go on husky sledding trips or cruise by majestic icebergs. Best Served Scandinavia runs a range of tours in the country that help you see the best the island has to offer.